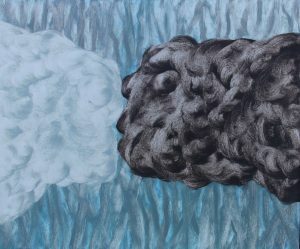 My contribution to The London Group’s Annual Exhibition (December 2018) was: ‘Kissing Clouds Passing Trees’ (oil on canvas, 51cm x 60cm). 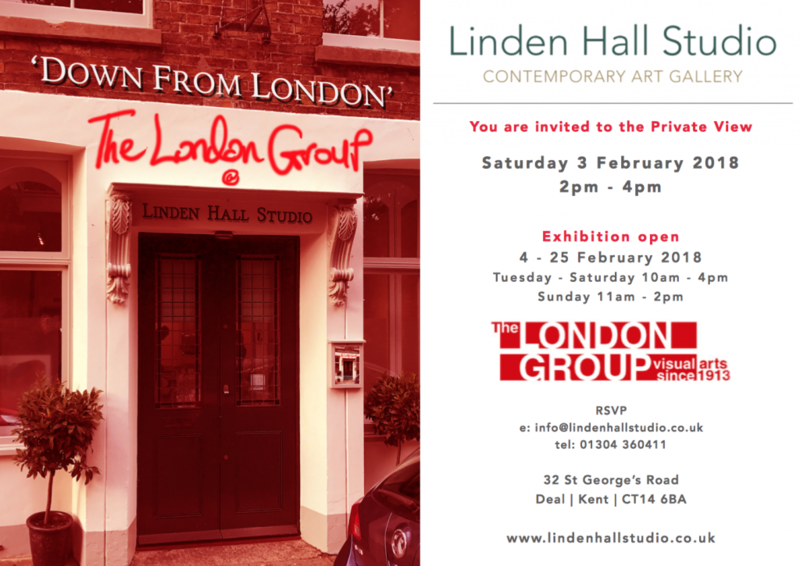 The London Group negotiated an exhibition-exchange with the Penwith Society of Artists of St. Ives. Penwith members exhibited a wide range of work at the Cello Factory in March, 2018 and 76 members of The London Group are exhibiting in the Penwith Gallery during September, 2018. 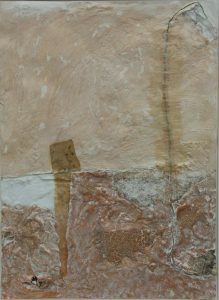 My contribution is ‘some time later’ (mixed media on paper, 95x76cm). 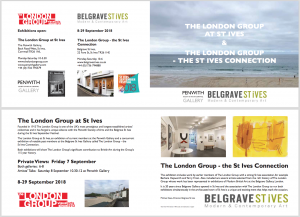 A companion exhibition, ‘ The London Group – the St. Ives Connection’ (including work by earlier members of The London Group, such as Barbara Hepworth – a founder member of the Penwith Society – and Terry Frost) runs concurrently. 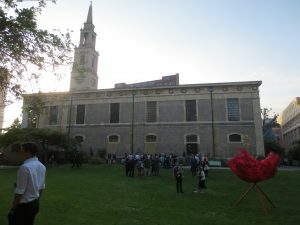 The London Group is participating in the Waterloo Festival with a variety of events locally and in the grounds of St. John’s Church. 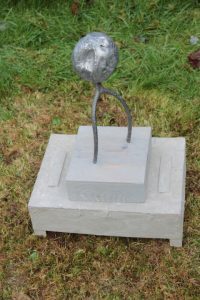 Under the title ‘Nothing endures But Change’ the Group’s President, Susan Haire, has organised and curated an open-air exhibition of ephemeral sculpture by both members and friends of the Group. 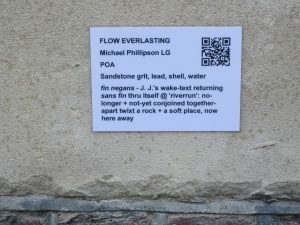 My contribution, a small but cumbersome lump of inscribed and collaged rock entitled ‘flow everlasting’, is sited on the tarmac at the rear of the Church. 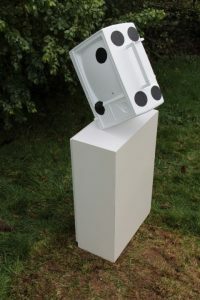 Very pleased that Theo Cowley is including my ‘Art’s Body’ audio-recording , featuring Jon Thompson, in a Luxus Extension event in Brussels celebrating Jon’s life and contribution to the arts on Friday, June 30th. 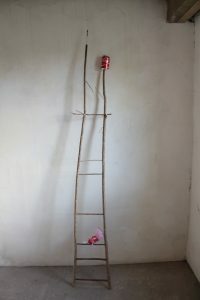 This event brings together works made between artists for particular contexts and in various forms of collaboration. 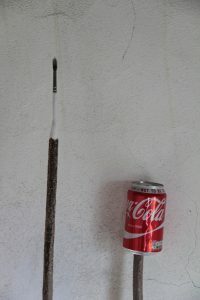 The works deal, on some level, with what is extra, yet intrinsic to art; the pool of resources that go into its production. Michael Phillipson’s audio work ‘Art’s Body: A Largely Sedentary Masque for Three Personae’ is a recording of a voice-text performance. Written by Michael Phillipson and performed by Michael Phillipson, Jon Thompson and Paul Filmer, during Jon Thompson’s exhibition ‘Ars Universitas by Jon Thompson’ at the John Hansard Gallery, Southampton, UK in 1985. Sadly, Jon Thompson died in 2016 while we were preparing this event. We have inserted Willem Oorebeek’s ‘Regarding the Towers of Babel by Jon Thompson’, 2006 and a silkscreen print by Jon Thompson from the above exhibition. 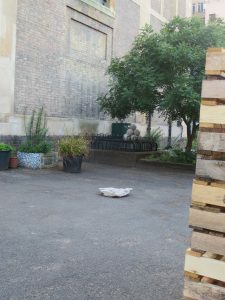 Axelle Stiefel’s video documents a performance intervention, one of 3 produced for a program of live video streamed performances called ‘Performance Proletarians’ at Le Magasin, Grenoble in 2014. Video and sound event, Friday 30th June, doors 7pm, starts 7.30pm prompt. No admission after. 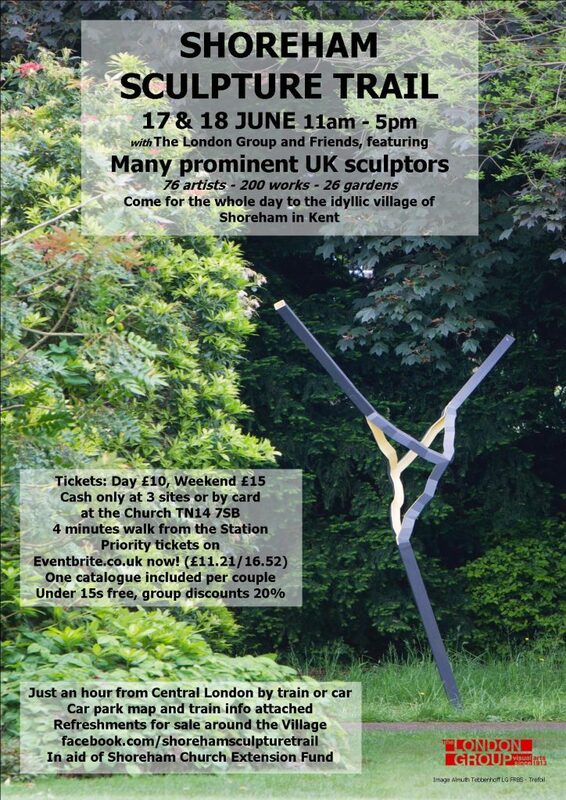 Delighted to be participating in The London Group’s ‘Sculpture Trail’ in the village of Shoreham on June 17th and 18th! 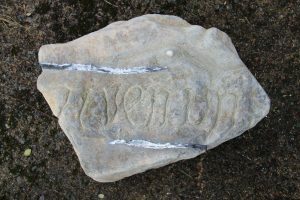 Here are images of four of the nine objects I will be placing in a lovely garden bordered by the River Darenth. 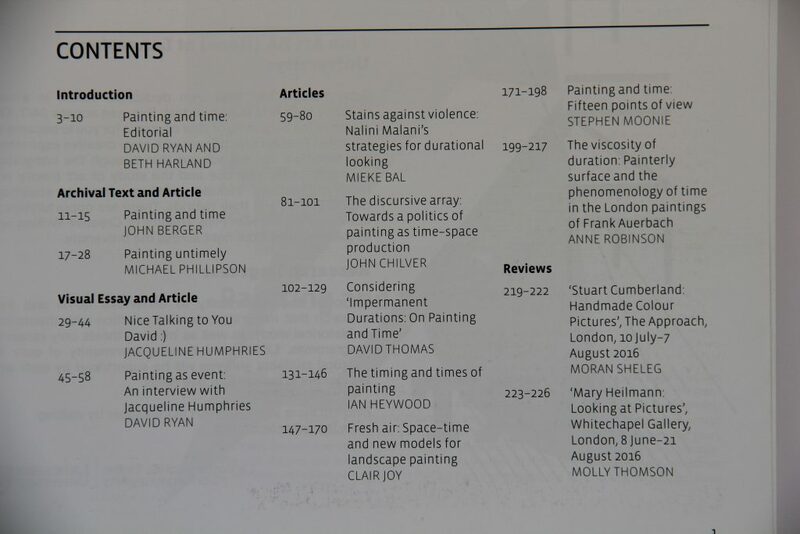 The catalogue for the Trail contains brief statements by the exhibiting artists. Here is mine! 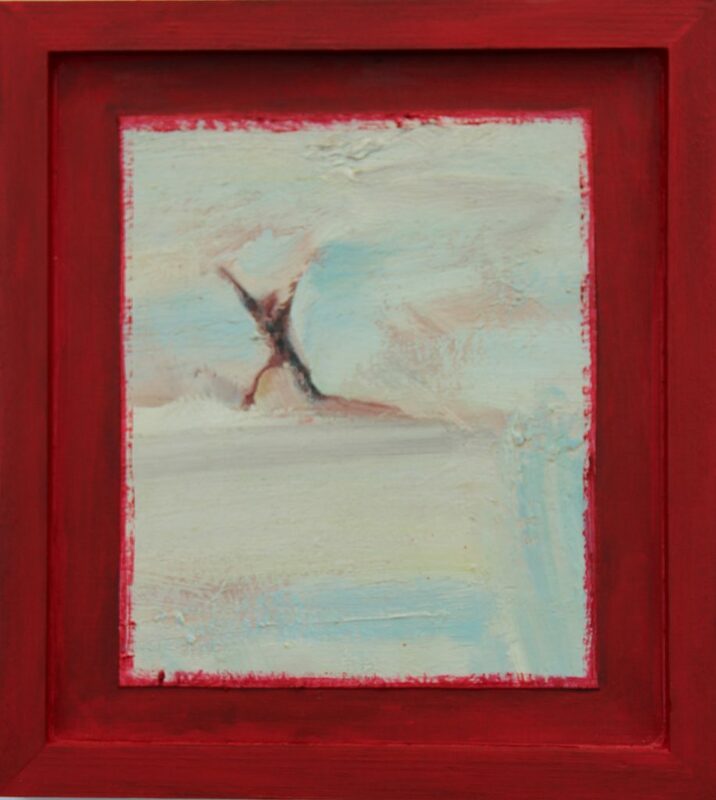 Although my making always falls back on painting I like to move across a range of media. My choice of medium is project-specific. 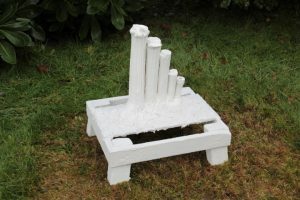 The three-dimensional objects (are they ‘sculptures’?) 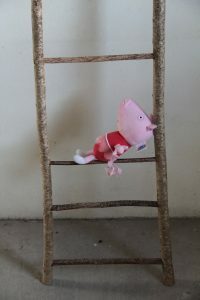 invariably emerge from some practical engagement with their materials. In the course of this handling they seem to propose something about their alternative potential as they fall away from usage! 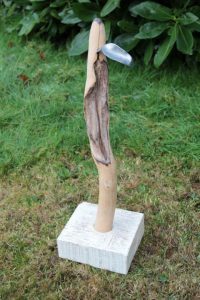 The vagrant materials – woods, metals, plasters, paints, machine-derivatives, whatever-at-hand – collaborate in a resolutely useless venture. In their alludings they may gesture obliquely to the painting life which, however temporarily, they have set aside. ‘sisyphean’, (hazel, toy, paintbrush, can, 216cm x 33cm x 28cm, 2016) was my contribution to The London Group Annual Members’ Exhibition at the Cello Factory, London, October, 2016.